Page CXVI are a band from Colorado, US, that has been releasing some stunning new arrangements of well-known hymns over the last number of years, following their mission as a group to ‘make hymns accessible and known again’. Their name is taken from a page of a CS Lewis novel, and is pronounced ‘CXVI’. This year has been a big one for the band. They made available their entire back catalogue for free on their website, clocking up more than 250,000 downloads. They’ve also been recording three seasonal records, the first of which is themed for the season of advent: Advent to Christmas. Advent to Christmas is, put simply, blissful. Across seven tracks we hear about the incredible expectation and awaiting for the Messiah to appear, as well as the good news proclaimed – that Jesus Christ is born! The mix of instrumentation and focus on classic hymns make it a truly sweet listen. The album opens with Awake My Soul, Awake My Tongue – my favourite track on the record. It’s a dreamy song filled with joyful trumpets and a great drive. Come Thou, Long Expected Jesus features complex rhythms, adding a real groove to this classic hymn. It moves into a bridge of dizzying heights. O Come All Ye Faithful is given a varied refrain and swells wonderfully; and the record closes with a beautiful version of Silent Night. The final track opens with a piano but continues to build and build, adding strings and breaking into a new bridge. “Y’know, we have been asked for the last four years to advent record specifically, and we had a lot of other projects – Hymns 1-4, Lullabies, and we had these other things we wanted to finish first. So when we thought about doing advent… in the last couple of years I had been getting into liturgy and the church calendar, all the seasons. So Dann, Reid and I sat and talked about it and we said ‘Why just do advent when we can walk all the way through Easter?’ So we decided to do three records. And the reason why is I really love the rhythms that celebrating these different seasons help create in our lives. Meditating on different parts of the gospel and who we are before God, what he’s done for us. This is a charming gospel-drenched record that will sit very well as a soundtrack to a Christmas dinner party, or for quiet reflection on this special time of year. A full transcript of this interview about Page CXVI’s Advent to Christmas is here. 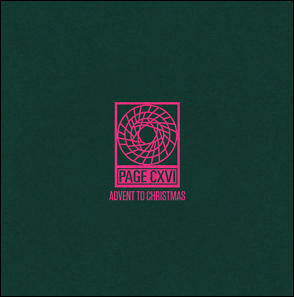 Advent to Christmas by Page CXVI is released Tuesday 3rd December and will be available at pagecxvi.com and on iTunes. Posted in MusicTagged Advent, Advent to Christmas, Album, Album Review, christian, Christmas, Colorado, CS Lewis, Easter, Jesus, Latifah Phillips, Music, Page CXVI, Silent NightBookmark the permalink.